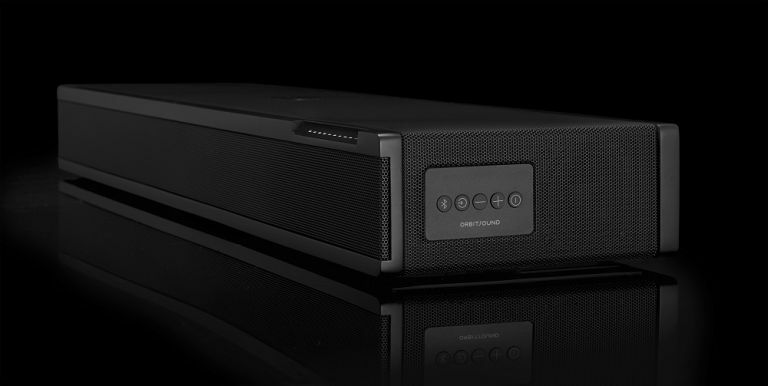 Today, British audio specialist Orbitsound has unveiled its latest compact soundbar, the One P70. With a price tag of just £299, this affordable soundbar comes with a built-in subwoofer and the option for three different uses (a tabletop speaker, a TV soundbar or a wall-mount. The One P70 features two central 2-inch drivers at 90-degrees, providing a broad wall of sound - which it helps it bring a new dimension to your audio setup of choice whether it be used vertical or horizontal. Alongside Bluetooth connectivity, the One P70 also features optical and 3.5mm Aux inputs and comes in a bamboo, white or black finish. This super compact device (measuring 70cm x 17.2cm x 7.5cm) will suit almost any home entertainment hub, so if you're ready to embrace the One, you can order one in black for £299 - deliveries will start from 10 March. The bamboo and white versions will arrive later this year at the same price. Four years on from the launch of its successful MR1 Mk1 Bluetooth stereo speaker system, Ruark Audio is back with its super-stylish successor - the MR1 Mk2. Coming in either a Rich Walnut or Soft Grey finish, the MR1 Mk2 retains the compact setup of the original and throws in an even more attractive design. The removable grille of the Mk1 has been replaced by a fixed and integrated grille, while the speaker's bespoke controller has been updated to include three-point pin LEDs and more to make extra useful. The MR1 Mk2 now has an AUX port so you plug devices such as headphones in with minimal fuss, while its optical input allows connectivity for the likes of Chromecast Audio and more. The Ruark Audio MR1 Mk2 is available now for £350. Speaker specialist Mission will announce the full UK availability of its latest, LX speaker range – a six-strong series including bookshelf, floorstanding, surround and centre-channel options - at this year's Bristol Hi-Fi Show. The LX range, which starts from £110, includes the LX-1, LX-2, LX-3, LX-4, LX-5 and LX-C and features fresh tweeter and driver designs, engineered for ultra-linear performance that minimises colouration. Available with white, black or walnut finishes, the LX range can work as both standalone speakers and as part of a wider surround sound setup, so they're an ideal choice for audio lovers all over. The LX-1 (Bookshelf or Surround speaker) is available now for £110, as is the LX-2 bBookshelf speaker - £160), LX-3 (floorstanding speaker - £400), LX-4 (floorstanding speaker - £500), LX-5 (floorstanding speaker - £750) and the LX-C (centre speaker - £110).